The former Beatle told Jonathan Ross on his chat show in 2008 there was "nothing" he missed about the city. But speaking after a performance ahead of a European tour - which includes a date in Liverpool - the 70-year-old Fab Four drummer said: "There's lots I miss, of course. "I did that joke with Jonathan Ross and I'm still paying for it, it seems - where three people from the Wirral complained. But of course I love Liverpool." Ringo Starr and His All Starr Band played the intimate gig for a handful of fans an well as journalists from around the world in a huge aircraft hangar, best known for being the studio for Top Gear. They performed four tracks for the audience, who sang along and clapped. They finished the short set with a rendition of the Beatles Sgt Pepper classic With A Little Help From My Friends, for which Ringo stood down from his drums and clapped his hands over his head. 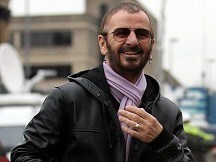 Speaking of his fondness for Liverpool, Ringo added: "I was brought up there. My family is still there - not my Mum and Dad of course. I have such memories of Liverpool. Liverpool is very close to my heart." Referring to the Jonathan Ross comments, he said: "People in Liverpool, my friends in Liverpool still, and my family, they thought it was funny." The band's 28 date tour starts in Kiev, Ukraine on June 4 and it is Ringo's first UK tour since 1998.